The iTunes App Store is about to reach 10 billion downloads. That makes this a good time to revisit app growth metrics and compare them with the other digital media store that we have data for: the iTunes Music Store. 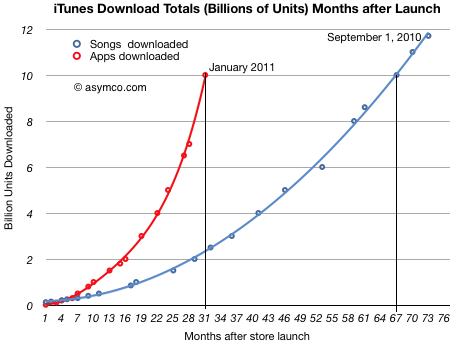 Assuming that 10 billion will be reached this month, we see how the steepness of the app curve implies that apps will overtake songs within a few months. I suspect by March. 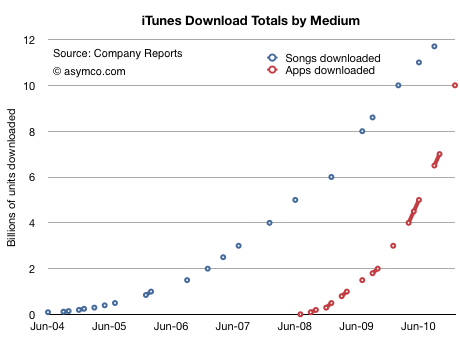 In September I made the prediction that total apps would overtake total songs sold by the end of 2010. That has not yet happened, but it’s close. I used polynomial curve fitting to draw the lines. The amazing story of this chart is not that apps are running at above 30 million download per day, but that the figure is growing. Growth like this is hard to get one’s mind around. Not only are downloads increasing, but the rate of increase is increasing. There is one final piece to put in place on this puzzle. Some might argue that the reason these download rates are increasing is because the installed base of devices is increasing at the same rate. In other words, app consumption could be steady on a per user basis. 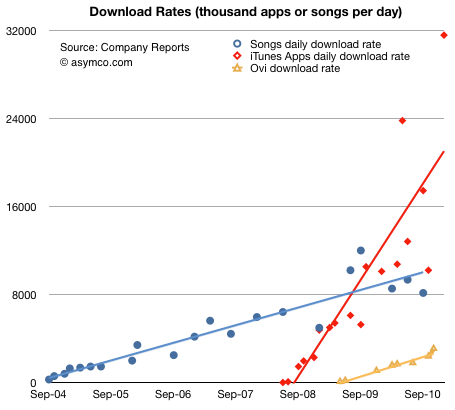 The number of apps downloaded for iPhone/iPad/iPod touch is running at more than 60. In the fall of 2008, there were about 10 apps downloaded for every iPhone/iPod touch. Two years later the rate was more than five times higher. There are significant implications for the network effects related to the iOS platform. End user investment in apps is even higher than end user investment in music which created a very tight lock for iPod users. Apps overtaking digital music is a watershed event. Apps are a new medium: they will impact all other media. As the number of apps attached to any single device continues to increase, apps create increasingly higher switching costs for users. Apps consumption is increasing at a rate to overtake the PC software market. The total apps does not include updates. 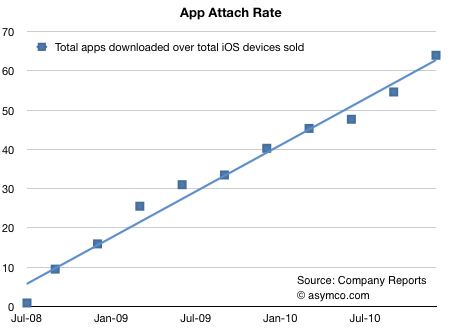 The attach rate is actually higher since the figures above assume all devices are still in use.